I never translate my own reviews into English, but sometimes other people do. Here is a text of mine written some months ago, translated by the artist. The spectator experiences the artist’s grief as her own in Elin Melberg’s combination of personal memory and strict minimalism. In the middle of the floor of the exhibition “Float” there is a large square vessel. It is 6,5 by 6,5 feet and is six inches tall. The vessel is filled with 53 gallons of silky soft waste oil – it resembles a black mirror. Had Elin Melberg been a minimalist, we might have interpreted this work as an hommage to Donald Judd or Robert Morris, to the minimalist artists of the sixties who wanted to liberate art from subjective emotional content through the use of geometrical shapes and industrially manufactured materials. But Elin Melberg is anything but minimalist. Her art has been described as “Bollywood meets the Vatican” with a strong element of glam and disco aesthetics. In other words, Melberg is known rather as a maximalist than a minimalist. More than anything, she is known for her large, sensuous spatial sculptures filled with silk, plush and glitter. I wish, I wish, I wish in vain (2009-11), recently acquired by Stavanger Art Museum, and the three-partite work What’s mine is yours to borrow (2012), which has been showed at venues such as the University of Oslo and in Gamlebyen Church in Oslo, are among her major works. 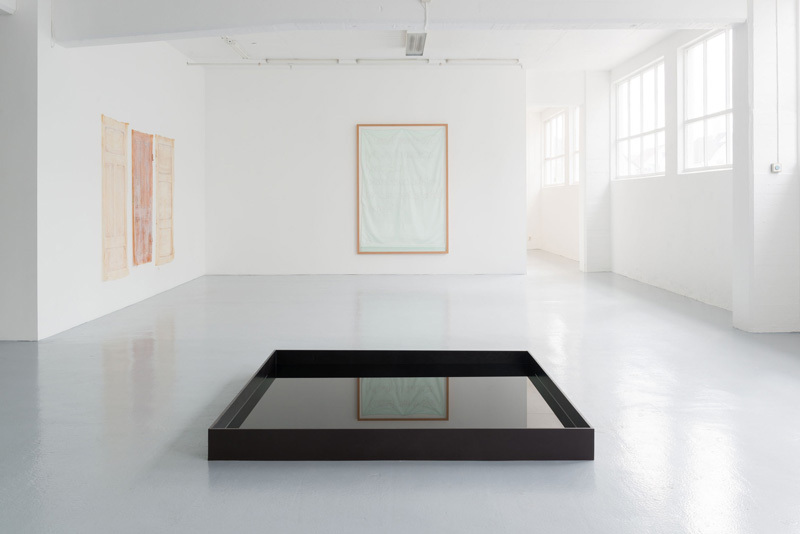 So, how are we to understand the simple black mirror – Float/Black fluid – around which her most recent exhibition is centred? All of the works in this exhibition are made after the passing of Melberg’s father in August 2013. In light of this it seems reasonable to interpret the exhibition as an expression of loss. Two wall-based works engage in a direct dialogue with the man who is gone. 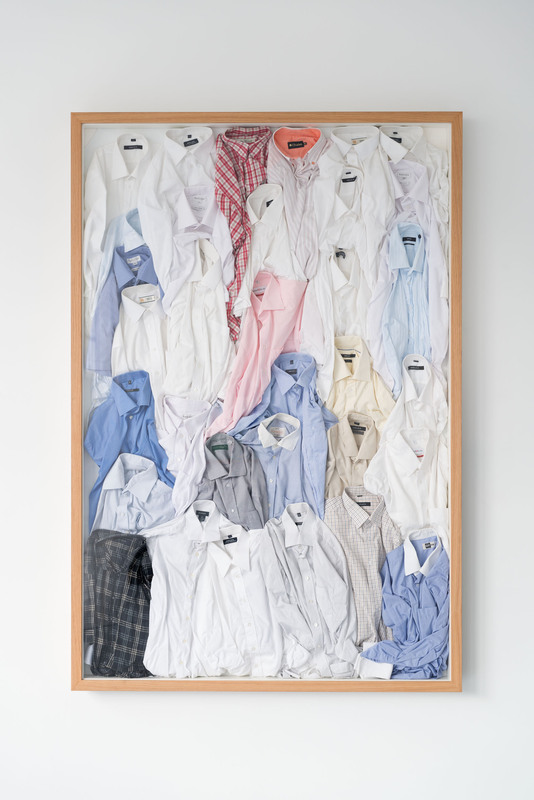 In 34 shirts Melberg has framed and mounted her father’s shirts in a huge display case. The shirts are closely packed: Gant, Melka, Boss and Van Heusen – still far from worn, shirts ready for more days at the office. In the exhibition’s most beautiful work, Elove, Melberg has embroidered the last text message her father wrote her in pink stitches on a big, pastel green fabric, as though she has been sewing on hospital sheets. The fabric is hung vertically on the wall and folds neatly at the bottom, as though the texting between father and daughter could go on forever. What is strange is that the words in the message are completely indecipherable. The writing is more than legible, but the letters are combined in ways that seem totally random – at least to those of us on the outside. It is as if the two people in question have developed a new and secret language. On the wall next to Elove three doors made from latex hang. 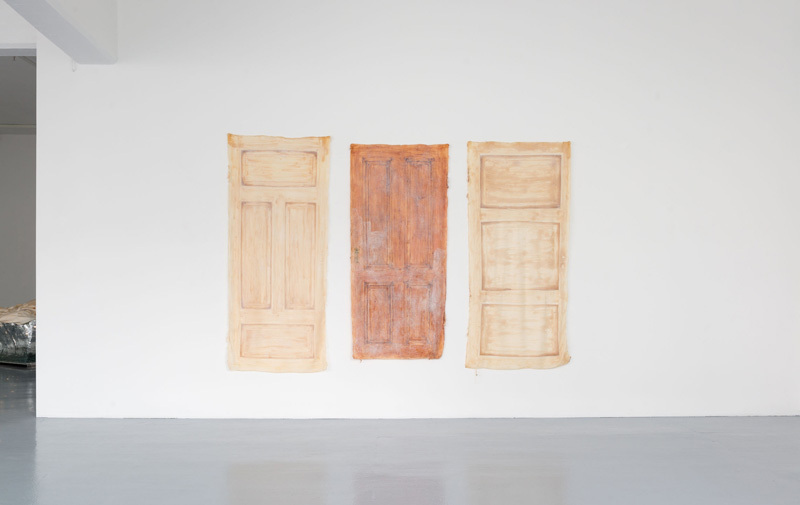 These are representations of reality, copies of actual life-size door blades, old doors, worn wood, made from thin, skin-coloured rubber. The dry wood has acquired a repulsive, damp quality. Doors, but no passage – perhaps these doors might take us closer to an interpretation of the minimalist oil vessel? The artist’s grief is omnipresent in this exhibition and it rubs off, it is as though we are situated on the edge of an endless black void. The simplicity of Melberg’s exhibition does not express a turn towards the minimalist, but rather a seriousness that concentrates the artist’s energy in a simpler artistic idiom. The black mirror is a magic mirror, a black hole of infinite attraction, a point of no return. We check our reflections in it, making sure we are still alive; the reflection it provides is silent and dark. The fear of falling, the dread of letting go. St. Augustine said: If you do not ask me what time is, I know it. When death enters the picture, time slips away beneath our very feet. Grief is a theme that is hard to put into words; feeling the other’s grief as if it were your own is almost impossible. Melberg’s great strength, and what makes her exhibition truly strong, is that she, by taking the onlooker with her to a place beyond language, makes us feel her pain in our own body. Through a combination of deeply personal memories, like her father’s shirts and text messages, and an almost mathematical minimalism, a form of abstracted subjectivity occurs. In the silky soft mirror – the nave of the exhibition – or its maelstrom – Melberg’s grief also becomes mine. I love the shirts … They seem to be ‘looking’ at me. Your article balances the various displays very well. Jane.